Tom Brusky presents this exciting new CD album with All Original Songs! 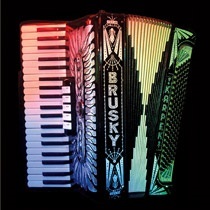 Tom Brusky has returned to his polka roots to deliver this exciting collection of new, original music. The title "Positively Polka" was chosen to convey that this is a CD album of nothing but polkas and waltzes. As much as Tom enjoys writing and recording music in other genres, you'll find no fox trots, country ballads, rhumbas, or pop standards here. The bulk of the album is comprised of instrumentals performed in the Slovenian/Cleveland-style, but you'll also find a few other polka styles as well as some amazing vocal performances and unique arrangements. This is a PolkaConnection.com recommended CD with all originals!